Linn is the kind of woman whose story and life would be famous in a heartbeat if she spent any of her time talking about herself, which she doesn’t. I was drawn to her since the first time I meet her via Instagram and we connected through SoulWork Club. Her kindness, and openness to healing through daily movement, meditation and SoulSurfing is truly inspiring. At 28, Linn lives a vibrant life serving in the public sector and leading yoga classes. I got interested in wellbeing when I started going to my local gym and attending BodyBalance classes because I had a lot of pain, especially in my back. I felt disappointed at first because I felt weak, stiff and not in the right place at all! However, I kept going, and after a while, I noticed that some of the poses felt so good in my body. I started to experiment more with the poses at home and enjoying it more and more. You recently did SoulWork Transformation. How was that and has it changed your ideas of wellness/fitness? Has it impacted any other areas of your life? I loved the transformation program because it helped me with getting a structure in my strength workout, which has always been a problem for me. It was easy to follow, very motivating and inspiring, and it made me feel strong and happy! It really boosted my energy! The most brilliant was the fact that there were both strength classes and more restorative sessions like meditation and the SoulSurfing available to me, so it integrated the body, the mind, and the feelings and intentions very well. The workbook was really inspiring, I enjoyed the time and thought spent SoulSurfing and the food plan was a great inspiration even though I didn’t follow it 100%. It changed my ideas of wellness because it made me realize that I can work towards having a stronger body and at the same time maintain my flexibility and softness. And it has taught me that I can train smarter, not necessarily harder, and that’s important to me! SoulWork Club has had a huge impact on my life! I move a lot more during the day, keeping the energy up and I manage to be more focused and effective at work, without feeling stressed. Having a regular practice like this is important to feel good in my body, to have a focused mind, and to be in a good mood. I think I’m a more happy, content and balanced girlfriend, sister, daughter, employee, and fellow human over all because I have more energy, feel more assertive and confident, and because it helps me fill up my own cup so that I can be there for others who need me! Can you share with us a bit about your history with illness and relationship with your own body? I know it’s a part of who you are as I see you nowadays fully radiant - you are truly incredible! Well, first of all, thank you so much! I have a history of illness and ailments, both physically and mentally. 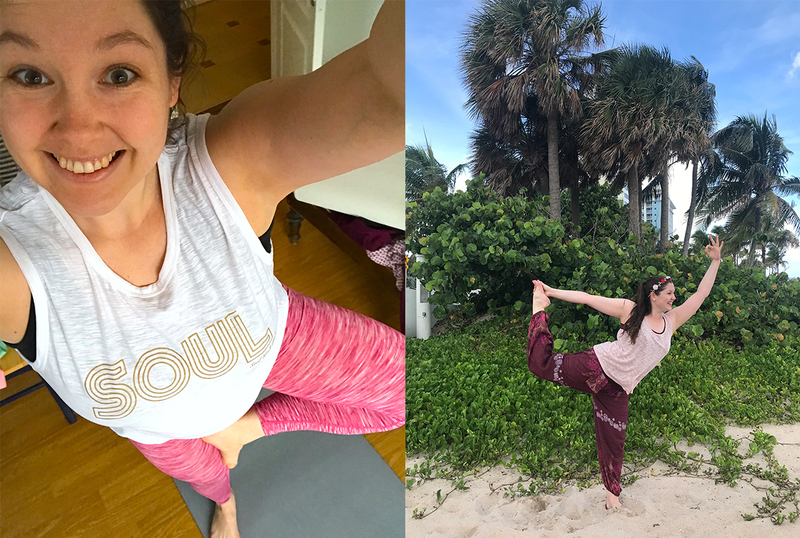 For many years I struggled with epileptic seizures, and worked my way through that with therapy and yoga, discovering that I was the master of my own health, my body, and mind. My seizures were triggered by both physical and mental factors. Mentally I am dealing with anxiety and stress, and it can be quite challenging and tiring from time to time. I learned a lot about how to handle that during therapy and my yoga practice, so today I don't need medicine or therapy to deal with it. Arriving there was truly empowering, and I have a tattoo on my left foot that says “styrke”, which mean strength. That’s a nice reminder for me because I know that I have the strength to overcome what I want! For many years I have struggled with a lot of pain in my body. My muscles hurt and get tired, and it comes from a joint hypermobility syndrome (Ehlers Danlos Syndrome) that affects the connective tissue in my body. In addition to that, my joints are loose, so I have to work quite a lot to stabilize them, I bruise easily and I have some digestive troubles from time to time. The hardest for me is living with the pain and the tiredness because I so badly want to have a lot of energy and be sparkling all the time. And it is hard to have a disease that is invisible. I am a girl with a lot of energy and most of the time with a big smile on my face, so it can be hard for people to understand that I also can be the girl who lies in bed crying and feeling powerless because my body hurts so badly and I am so tired. I work daily with acceptance and gratitude, which helps me a lot. I try to be good at handling change and the fact that some days are good and some not so good, and I still have some work to do there. I try to live at my fullest at my good days, and to handle the bad days as good as I can – with lots of help and support from my boyfriend. Can you share with us what happens in a typical Linn day? A typical day for me starts by getting up in the morning, getting ready for work and walking the dog. Some days I move or meditate in the morning, and spend time enjoying a cup of tea, burning some palo santo and lighting candles, and I love to start the day like that. After that, I drive to work and usually listen to a podcast or some music. At work, I either stay in the office, attend or lead a meeting or travel. After work, I or we take the dog for a longer walk in the woods, and I get some workout and chores done while my boyfriend makes a delicious dinner for us. In the evening, I often study yoga, preparing new classes or leading classes. I also love to read, and hope to do some more reading this winter than I have lately. The day usually ends with some quality time together on the couch, and a short evening walk with the dog, before I get ready for bed, where I often take the time to meditate before I go to sleep. What are your plans for yourself in the next 2-5 years? My plans for myself the next 2-5 years is to continue being more and more me! I want to explore my practices, both on the mat and in life, and continue to explore myself so that I feel as much like me as I can. I want to face some of my fears and insecurities and challenge myself to find out what is on the other side of that, especially in my role as a yoga teacher. I want to work on feeling more assertive and confident with my yoga teaching, trusting that I am good enough. I also want to keep developing in my day job, because I got it last year, and still have a lot to learn and experience. At home, I want to take care of my house, redecorate where it is needed and try to enjoy that process too! And I hope that I can get the time and energy to finish my book projects, and hopefully publish a book or two during the next few years. That has been a lifelong dream for me, and I feel ready to chase it now! Be present with your loved ones. Enjoy fresh air and nature every day. Walk barefoot as much as possible. Move your body throughout the day to create your own energy. Listen to music that makes your soul dance. Smile and laugh and look for reasons to do it :). Practice gratitude – make lists in your mind or journal with all the things you are grateful for. Drink lots of water. Appreciate the little things in your life. Don’t compare yourself to others, and instead, work on being the most magnificent version of yourself. Strive for uniqueness, not perfection. Any favorite wellness tools that are easy enough for us to copy paste into our everyday lives? I guess that many of the practices listed above can be used here as well! In addition to those tips, I think planning is important – make a date with yourself to workout, meditate, drink water, go for a walk, etc. and prioritize it no matter what (or as close to that as possible ;)). See opportunities to move and play every day; balancing on the fence, rolling your shoulders in the car, dancing, playing with your kids at home or at the playground and so on. Train smarter, the workouts in SoulWork Club help you to do. Get enough rest so that you can be the best you when you are awake – and resting is not Netflix or Instagram, remember that! Be conscious and present so that your rest has the highest possible quality. Find ways to workout and take of yourself that you like, have fun and stay motivated – enjoy the ride!